Cashew French Toast - Vegans Eat What? Vegans Eat What? If you think you need eggs to make delicious french toast - we've got good news! Blend the cashews, water, maple syrup and cinnamon together in a blender until smooth. Using a fork, poke a few holes in each slice of bread. Dip the bread slices in the batter, covering both sides well. Place the bread slices in a shallow pan that has been lined with parchment paper and refrigerate for an hour. Heat a large skillet with oil. Add the bread slices then cover the pan and cook about 3 minutes. Add additional oil if necessary to prevent burning. Flip the bread slices and cook an additional 3 minutes or until browned and cooked through. 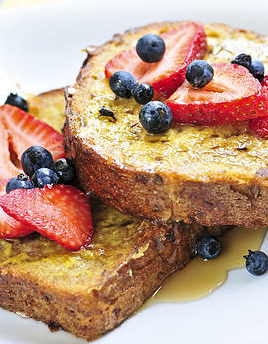 Serve warm with fresh berries and additional maple syrup. For nut-free French Toast, blend 1 banana, 1/4 cup plant milk, a pinch each of salt and cinnamon and 1/4 tsp. vanilla extract together until smooth. This makes enough batter for two slices of bread. Dip the bread slices in the batter and cook as directed above.